Thank you Toronto! In 2009 the Bruins sent skilled forward Phil Kessel North to the Toronto Maple Leafs in exchange for two first round picks (2010 and 2011) and a second round pick (2010). In 2010 we had the 2nd overall pick and the 32nd pick thanks to the trade, drafting Tyler Seguin and Jared Knight. In 2011, thanks to Toronto we had the 9th overall pick as we selected Dougie Hamilton. Today, both Hamilton and Seguin are expected to play huge roles in the 2013 Bruins season, but what exactly does Hamilton bring to the Bruins? Hamilton is a 6' 5" defender weighing in at 199 pounds. He is basically the same size as McQuaid. He is a skilled defender who also has an offensive presence. While playing in the OHL he put up 72 points up in 2011-2012 (17G, 55A), 58 points in 2010-2011 (12G,46A), 16 points in 2009-2010 (3G, 13A) and 53 points in 2008-2009 (20G, 33A). He also posted a (+-) of 37 in 2011-2012, 35 in 2010-2011 and -8 in 2009-2010. Let's also remember the kid is 19 years old, he has a lot of hockey to be played, and in 2009-2010 he was just 16 years old. Scouting reports say he has a skilled shot, which should help the power play unit (probably 2nd line), and has good mobility for his size. The only down side is he is inconsistent with his physicality. 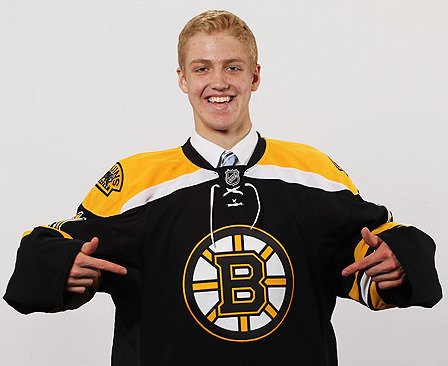 Let's face it he is a tall, lanky teen, I don't expect him to be dropping people like Chara. I expect him to make clean checks and add some strength to the blue line on offense and on the power play. If Hamilton can live up to the hype, he and Seguin will be soon running this team, and let's not forget about Jared Knight, who should get his turn in the spot light come next year. So, once again thank you Toronto, for giving us the opportunity to select 3 talented players who eventually will be the core.